The main focus in Jobortunity is on ’the heart’ i.e. 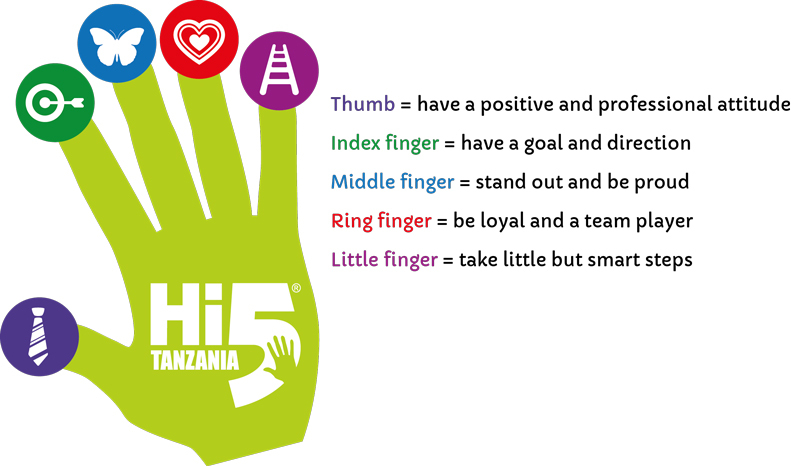 attitude therefore the entire curriculum is set up around Hi5, a training method developed by Jobortunity. All students’ development is recorded and analyses using a Hi5 Tracking system. Jobortunity developed more than 100 training lessons. For example in Thumb finger we teach about being professional by taking responsibility for your action; by leaning how to present yourself and understanding the importance of time management. Hi5 is ‘a way of working’, ‘a way of life’ and ‘a way of training’ suitable for anyone looking for employment but also anyone with employment. Staff development is needed for high quality company performance. Jobortunity offers attitude training for staff of companies. We practice what we preach. We are attitude trainers, with a focus on behaviour and its results. That’s who we are and what we do. We do not tell your people what to do, but we motivate them to do so and we are an example.